Moscow airports are bolstering security after the Brussels bombings. Moscow airports are bolstering security after the Brussels bombings, a source from the emergency services has told Interfax. "Security services of Sheremetyevo, Vnukovo and Domodedovo airports have been alerted. Gate details have been reinforced. Passengers and luggage entering airport buildings and the sterile zone are being thoroughly examined," he said. Cargo terminals have stepped up control over cargo and mail arriving by plane. The Domodedovo airport press service told Interfax the airport "has been complying with every airport safety requirement established by the law and regulations posted by authorized governmental agencies." Domodedovo airport does not have arrivals from Brussels on its March 22 timetable. "Given the tragic events, we recommend checking upcoming flights with air carriers," the press service said. 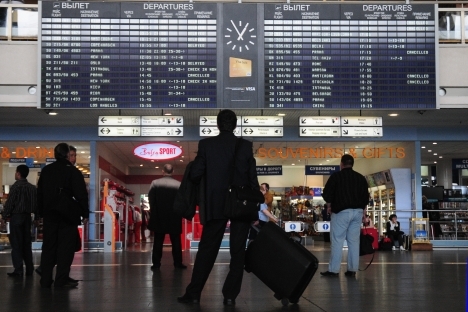 Russian aviation agency Rosaviatsia earlier said that air traffic between Russia and Belgium will not be closed, and all Brussels-bound flights are being rerouted to other airports of the European Union or will be cancelled until the Belgian capital's airport reopens.